Content by Tony Macklin. Originally published on June 29, 2011 @ tonymacklin.net. Cars 2 runs out of gas. It's on fumes -- and some of them pretty noxious. Pixar decided to dumb down the franchise. Lightning McQueen (voiced by Owen Wilson) is not the star of Cars 2. The new star is Mater, the rusted tow truck (voiced by Larry the Cable Guy). This allows the writers plenty of time to use bathroom humor, fart jokes, and other "belly laugh" mediocrity. And to top it off, the benighted character is knighted, and in the finale the writers have Finn McMissile, an Aston Martin (voiced by Michael Caine) say, Mater is the "smartest" that he has ever met. 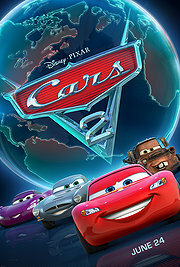 Cars 2 is about a series of races abroad, which may promote alternative fuel. McQueen competes; Mater interferes. Along the way, a British agent (Caine) and his assistant (voiced by Emily Mortimer) get involved in a nefarious plot. There may be enough color and motion to initially interest children, but the plot will lose them, and boredom may follow. If Pixar had made a short film with Mater to be shown before the feature, it probably would have worked, but as star of a feature film he's something of a wreck. If someone offered me a ticket to hear Michael Caine talk about acting, I'd go. If someone offered me a ticket to a show by Larry the Cable Guy, I'd pass. Not pass gas, simply pass. Having Larry the Cable Guy voice the star in Cars 2 is like making a movie with Whitey as star of the Bowery Boys or a movie starring Zeppo as the lead of the Marx Brothers. Cars 2 has a lot of whizzing cars, going nowhere. The dialogue has an occasional amusing line, but the music is third-rate. At one point in Cars 2, McQueen says, "Stop it, Mater, just sign off." If only. Instead Pixar decided to follow the advice of one of the criminal cars, who says, "Embrace your inner lemon."